The World’s Hardest Back-And-Foot Chimney? The Quarryman is one of those iconic British routes that is known round the world. Johnny Dawes, in his usual flair produced an incredible multipitch adventure out of Twll Mawr (“The Big Hole”). which featured one insane pitch of climbing. I remember watching the video of him climbing it when I was a teenager and thinking it looked like the best piece of climbing EVER. Like most people I never thought I’d ever go and even try the route, as it seemed impossibly hard and Johnny was too much of a legend to try and think about repeating one of his feats of climbing. 10 years later, I’d served a decent trad apprenticeship and gone on a mission of madness to do a load of horrible wide cracks. Which, was perfect…… as the Quarryman Groove pitch has been suggested as being the world’s hardest back-and-foot chimney! My first trip to try the Quarryman with Pete was a bit of a nightmare (well, much like the one today as well) as I absolutely hate heights and Twll Mawr is a bloody big hole in the ground. I have to confess pulling up off the ledge into the starting bit of the groove gave me the shakes and took me ages to try and block out the sensation of being so high on a slate wall. Most routes I do, I choose because they’re not too high, but the Quarryman is such a stunning bit of line, I had to dig deep to motivate myself to go there. At times I sat on that ledge thinking I hated it, but once I was into the climbing movement it all made up for it. Photo: Sean Villaneuva O’Driscoll probably feeling totally relaxed. Unlike me. Today, I went out with Adam Bailes (that boy will go far!!) and we both did the route after a few abortive attempts – some falls from the final move were met with a few tantrums! On working the route, I’d found that you can actually climb the whole beginning groove with none of Johnny’s funkiness (just a sketchy chicken wing and some heel-toeing in the corner), but after it a while it turned out that whilst possible, this method wasn’t exactly the easiest way of doing it! So back to the squirming it was…. Overall the groove is a route of two halves; thrutch for 30ft and then do a Superman for 30ft. Both totally exhausting in their own ways, but mainly just incredible climbing. Is it the hardest back-and-foot though?? I’d have to say I have my doubts as Book of Hate in Yosemite (5.13c/d?) looks a good bit harder, but then again looks can be deceiving. I think Caff is the only person to have done both. Good man. 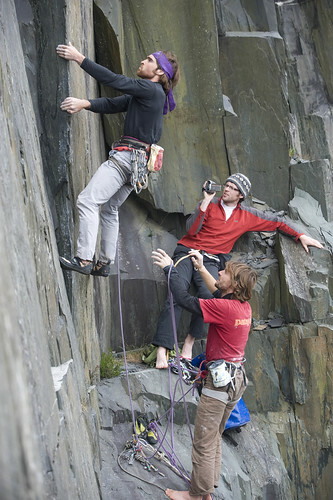 This entry was posted in Uncategorized and tagged chimney, Johnny dawes, quarryman, Slate by tomrandallclimbing. Bookmark the permalink.